There is a lot of useful information included on your monthly water bill. Billing Date: The date the bill was prepared. Service Period: The period of time you are being billed. Previous Reading and Current Reading: The difference between the current reading and the previous reading equals the month’s billable usage. Usage in HCF: The amount of water used during the service period. The District’s meters record usage in hundred cubic feet (HCF), so the amount of water used is recorded in HCF. Each HCF of water equals 748 gallons. Usage in HCF is shown in two locations on the bill. Usage in Gallons: To help customers easily understand the quantity of water used during the month, usage in HCF is converted into gallons. Usage in gallons is shown in two locations on the bill. Account: This is the customer’s account number. Account is shown in two locations on the bill. Meter #: This is the meter number located at the service address. Service Address: This is the address the meter serves. Service address is shown in two locations on the bill. Ready to Serve Charge: This is a fixed monthly charge determined by the size of your meter that is designed to cover the District’s fixed expenses, excluding interest expense. Arsenic Compliance: This is a fixed monthly charge determined by the size of your meter that is designed to cover the District’s debt service and operating costs for the two arsenic treatment plants. Zone Charge: The District has five zones: A (lowest), B, C, D and E (highest). Each zone above A zone represents an increase of approximately 100 feet in elevation. This charge is primarily designed to recover the electricity costs incurred to boost water to customers located in higher elevations. These charges are assessed on billable usage. Usage Charge: Usage is billed on a seven-tiered rate system. As water usage increases during the service period, the cost per unit increases per the tier structure. Usage charge is shown in two locations on the bill. Current Charges: Total amount of charges incurred during the current service period. Current charges are shown in two locations on the bill. Usage Graph: This graph displays two years of a customer’s usage in HCF. The most recent usage is shown on the far right of the graph. Prior Cons = Prior year consumption. Current Cons = Current year consumption. IWVWD Remittance Addresses, Telephone Number and Business Hours: The monthly water bill also includes a remittance envelope. Additional payment options are here. Previous Balance: Any amount owed from previous billing periods. Payments Received: Payments received between the last billing date and the current billing date. Past Due Balance: Any amount still owed from previous billing periods. Adjustments: Adjustments incurred during the current billing period. Additional Billing: Additional billing charged during the current billing period and can include but is not limited to a deposit or new service charge. 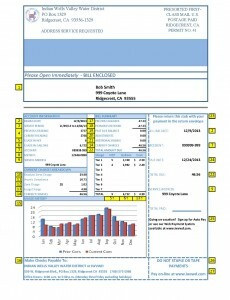 Total Amount Due: The total account balance that includes any past due amounts, adjustments, and additional billing. Return Payment Stub: Return this portion of the bill with your payment for proper credit to your account. Due Date: Payment is due by this date to avoid late fees or other delinquent penalties. Visit page 16 to learn more about delinquent charges. Bill Messages: Important information from IWVWD will appear in this area. Do Not Staple or Tape Payments: Please do not staple or tape payments to the payment coupon because checks or money orders can be torn when taken apart. Also, staples and tape stuck to payments can damage our check scanning equipment. Pay Online at www.iwvwd.com: In addition to making your payment online using our Web Payment System, customers can also use the system to review their payment and usage history.